The Department offers numerous educational opportunities, including detailed Species Information, Wildlife Trunks for teachers and a variety of Wildlife Posters. 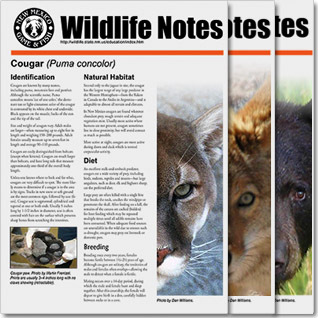 Wildlife Notes offer educational PDF’s on the wide variety of species that call New Mexico home. Select from the drop-down menus to download these printable pages to your local computer. 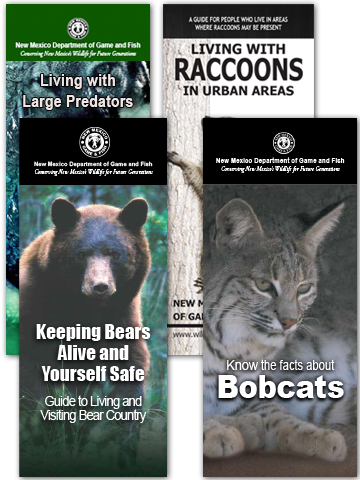 Posters featuring various New Mexico wildlife species. For complete listings contact Kevin or Colleen. 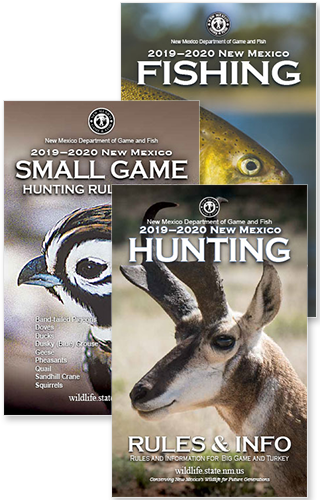 New Mexico Wildlife Coloring Books: Written at about the 5th-grade reading level, the coloring books include professional black-line art of New Mexico wildlife and habitats along with the state map locator for each species. 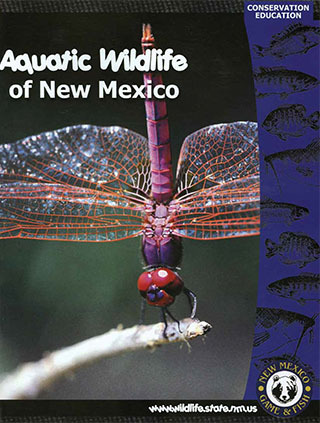 Introduction to New Mexico’s rich aquatic environments. Coloring pages, descriptions, and habitat ranges for: Bluegill, Mottled sculpin, American dipper, Yellow-headed blackbird, Checkered garter snake, Snapping turtle, Greenthroat darter, American beaver, Largemouth bass, Woodhouse’s toad, Bufflehead, Spiny soft-shelled turtle, Rio Grande cutthroat trout, Great blue heron, Bank swallow, Channel catfish, Belted kingfisher, Muskrat, Painted turtle, Western chorus frog, Osprey, Canada goose, American bittern, Sora, Water shrew, Longnose gar, Walleye, Canyon tree frog, and Tiger salamander. Includes “A Riparian Tragedy” and glossary. 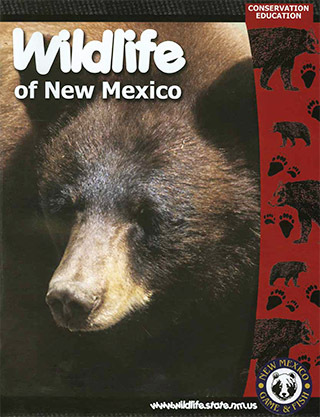 Coloring book with habitat ranges for New Mexico wildlife: Kit/Swift foxes, Lesser prairie chicken, Wild turkey, Western spotted skunk, Northern pintail, Collared lizard, Western meadowlark, Red-tailed hawk, Black-tailed jack rabbit, Burrowing owl, Mountain lion, Common raven, Elk, Blacktailed rattlesnake, Little brown bat, Coyote, Pronghorn antelope, Short-horned lizard, Greater roadrunner, Black-tailed prairie dog, Black bear, Javelina, Desert bighorn sheep, Sandhill crane, Abert’s squirrel, Porcupine, Pinon jay, Dusky shrew, Western bluebird, and Ringtail. Glossary included. 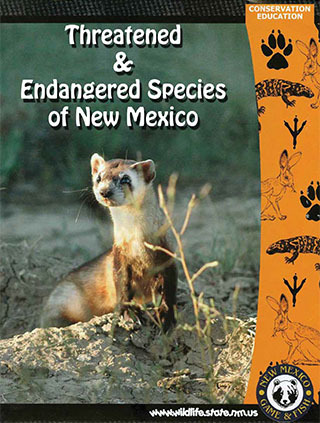 Introductory text, glossary, and coloring pages with descriptions and habitat ranges for: Peregrine falcon, Gila trout, Bald eagle, Broad-billed hummingbird, Mexican gray wolf, Neotropic cormorant, Sand dune lizard, Southern pocket gopher, Gray-checkered whiptail, Bell’s vireo, White-sided jackrabbit, White-tailed ptarmigan, Least tern, Common black-hawk, Colorado river toad, Meadow jumping mouse, Colorado pikeminnow, New Mexico ridgenose rattlesnake, Gila woodpecker, Socorro isopod, Western river cooter, Least chipmunk, Thick-billed kingbird, Jemez mountain salamander, Elegant trogon, Pecos bluntnose shiner, Gila monster, American marten, and Whooping crane. 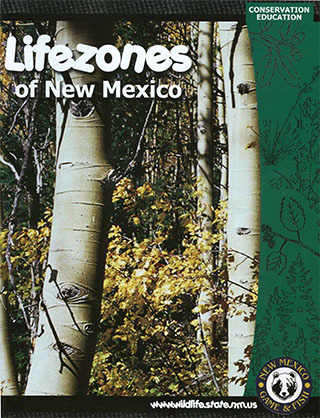 New Mexico lifezones includes alpine, subalpine, coniferous forest, transitional (mountain), grasslands, woodlands, and desert environments. Book includes coloring pages together with descriptions of plant and animal life, as well as a glossary.